Did Senate Majority Leader Harry Reid really hear from an investor in Bain Capital that Mitt Romney didn’t pay income tax for 10 years? Probably not. Even if he did, what are the odds that this “information” was just uninformed speculation? Pretty good. 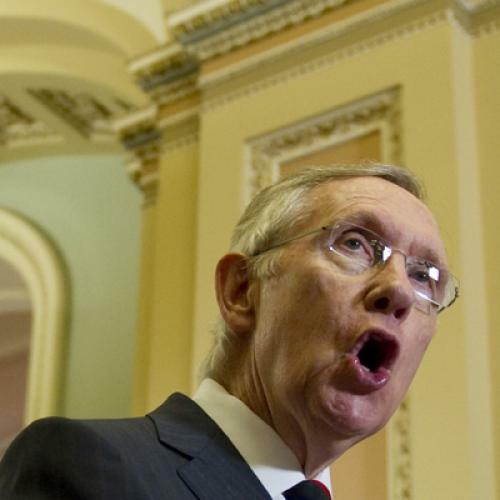 “Now, do I know that that’s true?” Reid told the Huffington Post’s Sam Stein and Ryan Grim. “Well, I’m not certain.” Brilliantly played. Make the accusation as broad as possible—10 years!—so that Romney will want to demonstrate that Reid (or Reid’s source) is a liar by releasing tax records showing he only paid zero taxes for, say, three years. Reid shrugs, says, “I guess my guy was exaggerating.” Romney’s candidacy takes a huge and possibly fatal hit. Advantage: Obama. But Romney isn’t falling for it. And now Reid’s getting sloppy, raising the stakes by saying, “I have had a number of people tell me that.” Really? More than one person has told Reid that Romney didn't pay his taxes for 10 years? No way is anybody going to believe that. Advantage: Romney. If, by any chance, you are a Bain investor (or anyone else) who is privy to Romney’s unreleased tax returns and has shared this information with Reid (or not), please contact me at timothynoah@tnr.com. If you aren’t privy to Romney’s tax returns and just want to blather about them, please do not contact me. Oh, and please don’t commit any crimes in order to secure this information.